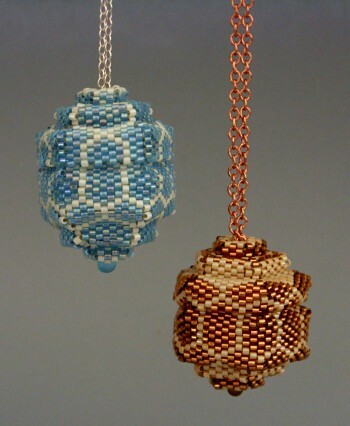 These "pendant with a secret" pieces are a continuation of my Geometric Beadwork series which I have evolved into making more 3d shapes which can be adapted to be worn and used in different ways. Inspired by the shape of a tea caddy, I wanted to create a piece which could be opened and used as a vessel, but which was small enough to be worn. I also wanted to keep the "lid" hidden and attached to the main body. You can see further adaptations of the pieces here and here. The instructions for the adaptations of this project are now available to purchase.